GSK3 Alpha antibody LS-C18920 is an unconjugated rabbit polyclonal antibody to human GSK3 Alpha (GSK3A). Validated for ELISA and WB. Synthetic peptide from human GSK3A / GSK3 Alpha. This affinity-purified antibody has been tested for use in ELISA and by western blot. Specific conditions for reactivity should be optimized by the end user. Expect a band approximately 52 kD in size corresponding to GSK3A by western blotting in the appropriate cell lysate or extract. Less than 1 % reactivity is observed against the non-phosphorylated form of the immunizing peptide. This antibody is phospho specific for pS21 of GSK3A. Anti-GSK3A Antibody - Western Blot. 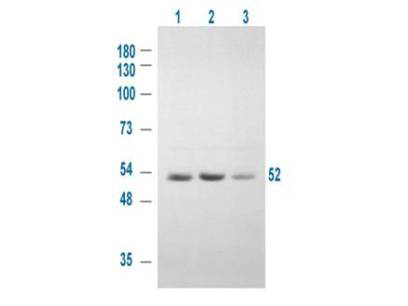 Western blot of Affinity Purified anti-GSK3A antibody shows detection of a 52 kD band corresponding to human GSK3A in various human derived 293T cell extracts. Cells were serum starved for 24 h. Lane 1: control, Lane 2: treated with IGF-1 (100 ng/ml) for 20 min, Lane 3: pre-treated with 10 uM LY294002 (selective PI3K inhibitor) and treated with IGF-1 (100 ng/ml) for 20 min. Lane 1 shows some baseline GSK3A reactivity that is intensified upon stimulation (lane2) and diminished when an inhibitor is added (lane 3). Approximately 20 ug of lysate was run on a SDS-PAGE and transferred onto nitrocellulose followed by reaction with a 1:1000 dilution of anti-GSK3A antibody. Signal was detected using standard techniques. Personal communication, Angela Carter, Experimental Therapeutics, Ontario Cancer Inst, Toronto, Canada.